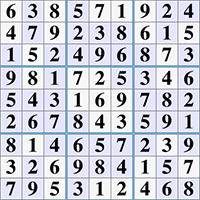 Sudoku is a very popular logic puzzle that you can often find in local newspapers and magazines. The goal is to place the numbers 1 through 9 into the grid such that each row, each column and each sub-square contains all 9 numbers. There is no math involved. All you need is patience and logical ability. Click on a square to activate it and then type a number to enter it. To clear a mistake, click the square again and press 0 or delete. To make pencil marks, type a number while hovering your mouse over the square without clicking. Pencil marks can be removed by typing the same number again or by typing 0. The goal is to place the numbers 1 through 9 into the grid such that each row, each column and each 3x3 box contains all 9 numbers only once. By looking at which numbers are already in the different rows, columns and boxes you can deduce which numbers belong in the empty squares. There are a variety of solution methods that you can use to help you solve the puzzle. 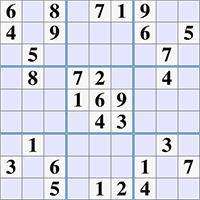 View our sudoku techniques page to learn advanced methods.